Why Amazon and Angie's List made headlines on Wednesday. 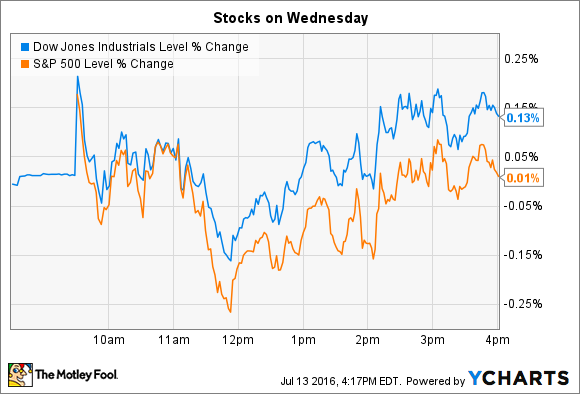 Stocks took a breather on Wednesday following record-setting days in each of the prior two trading sessions. The Dow Jones Industrial Average (DJINDICES:^DJI) edged up to another fresh high by gaining 25 points, or 0.1%, while the S&P 500 (SNPINDEX:^GSPC) finished the day unchanged, at a record 2,152 points. In economic news, the Federal Reserve's latest data showed modest, steady growth across the economy over the last month. Job-market conditions are stable, inflation is low, and consumer spending has been generally positive, according to this month's beige-book report. Meanwhile, individual stocks making headlines on Wednesday included Amazon (NASDAQ:AMZN) and Angie's List (NASDAQ:ANGI). Amazon's customer orders rose 60% over the prior year's sale to make it the busiest day on record – even better than the most-recent Cyber Monday that produced 23 million item orders in the heat of the holiday shopping season. That Amazon could beat those holiday results in traditionally slow July is yet another reason why brick-and-mortar retailers should fear the online-selling giant. Besides ringing the register, Amazon succeeded in extending its ecosystem with Prime Day. It sold a record number of its branded devices like the Echo and Fire TV, convinced many more casual shoppers to sign up for its Prime membership, and deepened ties with third-party sellers, who are accounting for a larger percentage of sales -- and helping drive profitability higher in the process. The Prime Day totals won't go into the quarterly results that Amazon posts later this month as they occurred a few days after the end of the quarter, but consensus estimates still target a 27% Q2 revenue boost, to nearly $30 billion. Angie's List, which specializes in providing consumer reviews for home services, jumped 6% after it announced a faster-than-expected revamping of its business model. The company dropped its paywall for customers seeking access to its collection of 10-million service reviews, while adding two premium membership tiers – one for $25 per year, and one for $100 per year. "This is a transformative moment for the new Angie's List," CEO Scott Durchslag said at a launch event, "as we welcome more consumers into our community." Durchslag and his executive team are hoping the change will revitalize the business. Angie's posted zero overall sales growth last quarter, and generated a net loss, as membership revenue sank 6% lower. However, it noted back in April that the few small markets it was using to test the freemium model were seeing improved customer engagement and satisfaction. With the migration running ahead of schedule, all of its markets are now benefiting from that open business approach. The key question for investors is whether the move can produce substantial market share gains in a niche that's attracting well-capitalized competitors, such as Amazon.